Zuri is a Full English Cream Golden Retriever. 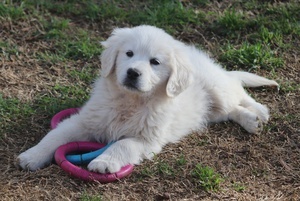 She has a very soft, white coat and also has an amazing conformation. She is so loving and eager to please us. Gets along very well with all of our Goldens.